Time to celebrate! Taylor Swift’s longtime BFF Abigail Anderson is engaged to her boyfriend, Matt Lucier. The bride-to-be announced the exciting news with a gorgeous Instagram photo of herself kissing her new fiancé on Tuesday, June 28. 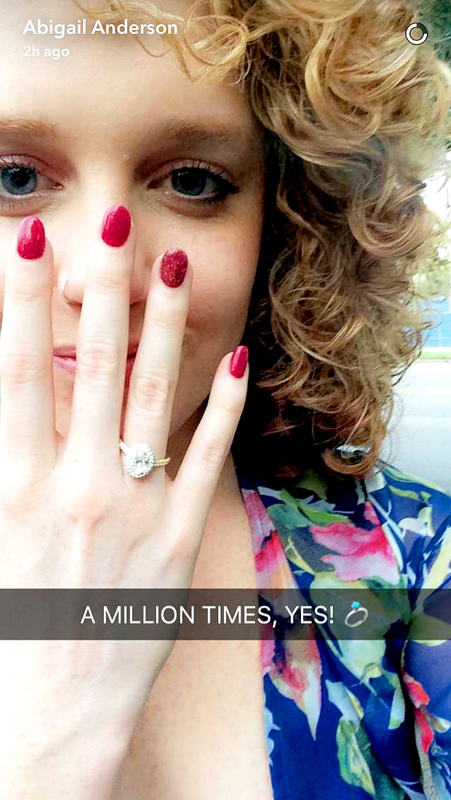 Shortly after the sweet proposal, Anderson also shared the news on Snapchat. “A MILLION TIMES, YES!” she captioned a picture of herself showing off her gorgeous new engagement ring. Anderson, 26, was the inspiration behind Swift’s 2009 single “Fifteen,” which tells the story of the duo’s freshman year of high school, where they both suffered heartbreak for the first time. In April 2015, the pop singer, 26, threw her BFF an epic 25th birthday party in Nashville, where she surprised guests with a fun-filled performance from Anderson’s favorite band, Dashboard Confessional, and Paramore lead singer Hayley Williams. Swift and her new beau, Tom Hiddleston, are in the midst of a romantic globetrotting adventure. Since going public with their relationship on June 15 (only two weeks after her split from Harris), the couple has traveled to Rhode Island, Nashville, Los Angeles, England and Italy.